Beginning Wednesday, February 13th T-Mobile will offer a promotional family plan add-a-line option with $0 Value and $5 Classic add-a-line offers. 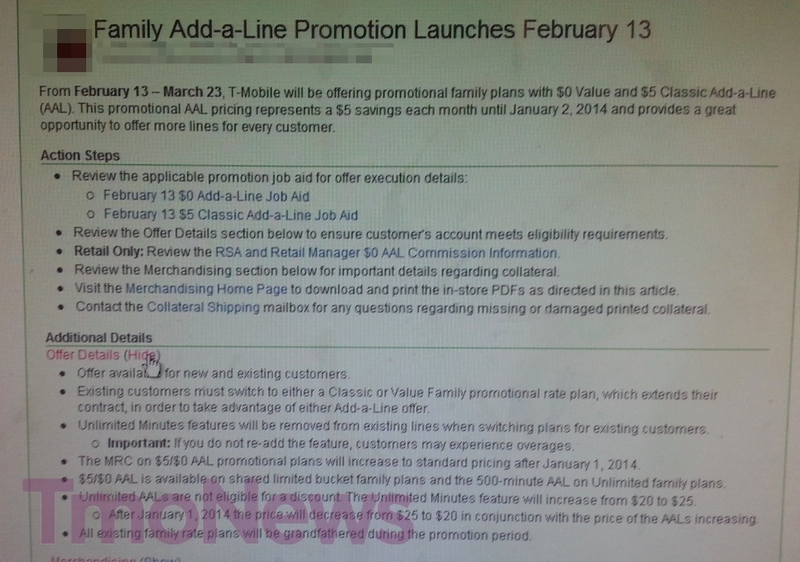 This add-a-line promotion represents a $5 savings each month until January 2nd of next year. Existing customers can take advantage of this opportunity by switching to the Classic or Value family promo rate plan, which does come with a contract extension however. The $5/$0 add-a-line offer is available on shared limited bucket family plans and the 500 minute add-a-line option for unlimited family plans. Unfortunately, according to the above image, unlimited add-a-lines are not eligible for a discount. In other words, the primary line can have unlimited minutes, but the second-fifth lines are not eligible for a discount if they choose unlimited minutes. The good news is that they will qualify if they opt for the 500 minute add-a-line option. Get it, got it, good? This offer will run through March 23rd, which is timed nicely with the rumored launch of the iPhone and Value Plan only atmosphere on T-Mobile. Coincidence? Maybe. The first two lines would have unlimited not just the first line. Unlimited minutes on AAL’s are $20. You can add unlimited minutes. This article is wrong. Isn’t this the same promo they’ve been having since last year? Or did they stop it and now it’s restarting? When I moved our 3 lines from Classic to Value last October, our 3rd line got the $0 (500 minutes/unlimited text) add on until January 2014. Looks to be the same. Yeah it’s the same promo, the last one ended in November. It’s the same as the back to school sale from the summer. Simply re-introduced for more customers to be able to take advantage! This is better then the all phones free sales we do all the time! Besides, we actually have 8 phones that are $0.00 down after rebate and with the AAL sale, its a pretty good time to become a T-Mo customer! You seem rather knowledgeable. Is it safe to assume you’re an employee? Managers have access to remove blocked IMEI #s but only if they were blocked for a reason other then theft or stolen. That is also only if the person you are with can prove they purchased the phone directly from T-Mobile or an affiliate. I hope this helps! (yes i am a store manager) If you buy a phone from Craigslist or EBay……well don’t because it usually is bad news! If you can get the IMEI before you pay for the device, call a local corporate store and we can check it’s status. The contract extension for another 2 years for an additional line with 500 minutes is a steep price. Isn’t this a bit of a rip off? Its just re-offering what they did previously with the same “return to standard pricing” date. It’s not a rip off for new customers or a customer who didn’t take advantage of the back to school sale in the summer. Your still getting 11 months at a discount….not much of a rip off if you ask me! I apologize, I expressed myself a bit distastefully. I meant that the deal is not as good as when they first started this promotion. So I was kind of disappointed. Either this isn’t the same as the previous offer or I got something else, because my second line is included in the base plan and 3-4 are $5 each. All 4 of my lines are unlimited talk/text on a Classic Family plan. Does that mean that if I am currently on a “Individual Value Plan” I can add a line for $0 and in effect lower my bill $5/month until Jan 2014? That sounds too good to be true. What am I missing here? I’d just add a line and let it sit there for doing nothing for forever and take advantage of the $5 discount. Is this correct? Look at it as delayed billing. You won’t get charged the extra $5 for adding a line until January 2014. Come January 2014, the $5 will be added to your bill. This doesn’t include data, tax, insurance etc. of course. Those will be billed monthly starting from the day you add the line. Ah, I see. I read that wrong. No that’s still incorrect, this is only for family plans. You stated you have an individual plan so in your case if you add a 2nd line it wouldn’t be the $0 value add a line. You would be charged for whatever family value plan you chose. For example a 2 line family value plan unlimited talk and text is 79.99. AAL are only the 3-5 Lines. So I just converted my unlimited family plan with a $19.00 add a line in January to unlimited value with a $5.00 add a line, can I go to the Tmobile store and get them to do this instead? They would just extend my contract again correct? well it would only add a month to my contract. seems worthwhile to get 5 dollars off for a year. Would this apply to new activations as well? hence the term Add A Line!!! Yes it applies to new accounts! any deals with the galaxy 3 ? in retail store, GS3 is currently 199.99 down with 100.00 rebate (either bill credit in 12 months or mail in depending on your credit class) making the down payment Net 99.99. Keep in mind, you can also add the 500 minute line on Value for $0.00 and add the $10.00 any mobile feature and basically have an unlimited plan for $10.00 with 500 minutes to call landlines!!! Just so I’m clear. I current have family plan for 2 main lines + 3 AAL at $10 each. I can call to have the 3 AALs lowered to $5 each? Nice to see the internal T-Mo memo on this sale as it reveals important hidden details. PLEASE NOTE one of those details–“IMPORTANT: If you do not re-add the feature, customers may experience overages.” Case in point, I change my plan over the phone one time and the otherwise very competent forgot to re-add text and other blocking features to my family plan. Despite that, I find T-Mo’s customer service above and beyond Sprint’s and especially AT&T’s and Verizon’s customer service. The phones our family’s has/had with T-Mo have lasted longer and we’ve been more satisfied with them than those other carriers, especially Sprint’s Nextel phone which were way short of being as rugged as they should have been. Oh, my 23yr old son wanted to be “an adult” and jumped ship to Verizon a few months back and is already having problems with his new phone. My latest phone is the HTC Amaze with 42Mbps capability–I sometimes experience a delay in connecting to the Internet when I tether, but otherwise when I’m relatively close to a tower this puppy blows my AT&T DSL out of the water. (OK, its their second lowest speed plan, but their DSL customer service stinks and the line running into our house has developed constant brief outages. A bright spot with AT&T was a level-2 rep I came across who was extremely knowledgeable and solved a couple of non-AT&T Internet problems I had–they need to clone that guy big time.) My fool of an older brother thought he was being cute and got my 86yr old Mom a free iPhone 4 for her Verizon account. Even after taking a number of iPhone clases, she still can’t figure out the phone and at $90/mnth I wish I could transfer her over to my family plan, but despite a T-Mo store rep saying he just heard its possible, I don’t think so due to at least the cell spectrum being different–maybe T-Mo and Verizon share one or so frequencies, but one would hope to be in the right spot all or a vast majority of the time.